The Strawberry Full Moon will be shining bright in our lives in the wee hours of June 28th, but while it sounds light and sweet, its influence couldn’t be more different. That’s because this year’s Strawberry Full Moon is hanging out in Capricorn. The sea goat is notorious for its work ethic, ambition, and going after what it wants with a laser focus. So how will this powerful moon affect your zodiac sign? Of course, Capricorns will be most affected by this full moon (which isn’t even red by the way — it will be more of a honey hue), so those with a lot of Capricorn in their charts will feel it most. But that doesn’t mean the rest of us are getting off scot-free. Oh, no. The Strawberry Full Moon is about to give us a reality check. Though summer just kicked off, this full moon is here to remind us that we can’t while away the hours sipping fancy drinks on the beach. Not to worry: In case you feel overwhelmed with life, Capricorn’s practical nature will give you clarity and focus to help steer you in the right direction. Here’s how the Strawberry Full Moon will affect your zodiac sign. You’re feeling indecisive today, Aries. There are many options to choose from, and for the first time in a long time, you’re doubting yourself (thanks, Mars Retrograde). Take a moment to gather your thoughts and tune into your heart. Then, choose the option that scares you the most. Yep, seriously. Because you’ll grow the most with that one. You’re daydreaming, Taurus, and having a hard time dealing with reality. Though it’s really easy to get caught up with social activities, Netflix, and even the drama of others, those distractions aren’t truly serving you. Take this time to get honest about something that’s nagging you, and then do what you need to do. You’re feeling more frenetic than ever, Gemini. You’re being pushed and pulled in many different directions. Everyone knows you love staying busy, but you might want to see what being still feels and looks like. In fact, your soul demands it. Get a massage, take a walk, and, most importantly, learn to say no. It’s time to have some fun, Cancer. Get out your paints or your notebook, and just create. Creating for the sake of creating is not only enormously freeing, but it’s also healing. You need to get out of your head and remember what it’s like to play again. It’s okay to lighten up. You’ve been hesitating on taking action, Leo, which is unusual for a confident Lioness like yourself. Remember that you have everything you need and you know everything you need to know. Go after what you want during the full moon — but instead of attacking like a lion, try to charm like a kitten. You’re feeling out of sorts lately, Virgo. Nothing seems to be going your way — or so you think. Flip the script today in your head and see things working out for you rather than against you. More than likely you’re being too critical, as usual. Decide to go with the flow, and see where it takes you. You have many desires, Libra, but what do you really want? In order to get to the bottom of that question, ask yourself another one tonight: “Why do you want what you want?” Often it’s our why that gives us purpose and clarity. Once you claim your why, you’ll feel more excited than ever before. It’s time to get clear about a certain relationship or situation, Scorpio. Which means it’s time to ask the tough questions. The type of questions you’re scared to ask because you don’t want to know the answer. Remind yourself that the truth will set you free…and then ask tonight. Speaking your mind, Sag, is something that you normally don’t need to be reminded to do. However, the cosmos are messing with your head and making you second-guess yourself. You have something worth saying, but sometimes the delivery holds more punch when you do it at the right time. Hold off, and then plan your verbiage for tomorrow. Is there an itch you’d like to scratch, Cappy? Maybe a project you want to start or a new person who you would like to know better? 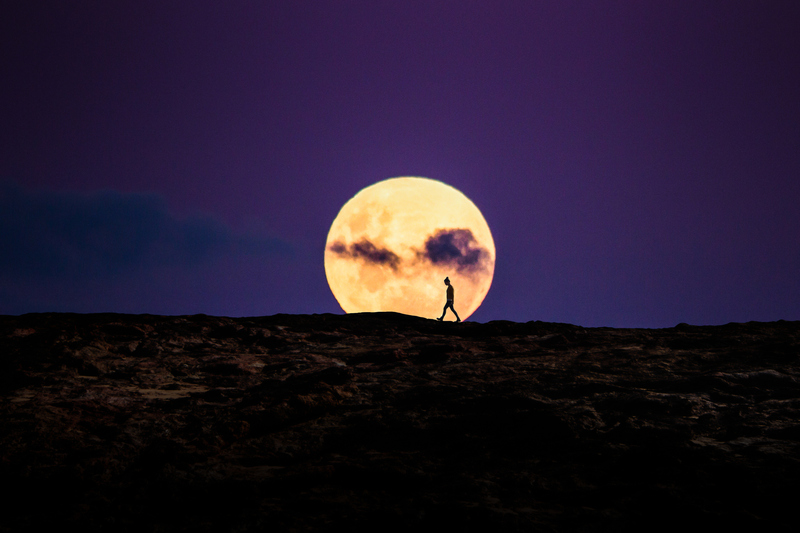 This is your full moon, so you’re feeling more intense than ever. Channel that energy to plunge ahead with your desires. Then go ahead and scratch it. Hold your head up high tonight, Aquarius. You’ve been experiencing some self-doubt lately, but tonight is the night to shine. Maybe that means getting dressed up and hitting the town with your besties, or maybe that means trying a new activity or hobby. Whatever it is, do it with confidence because you’re hot AF. You’re feeling a little more emotional than normal, Pisces. Full moons usually make you weepy, so take this time to ground yourself and explore the reasons behind your feelings. Dig deeper. Is there something that your emotions are hiding? A reality that you don’t want to face? Don’t let your tears stop you from moving forward. We will be feeling many highs and lows tonight, bbs. Remember that full moons are here to teach us and ask us to grow, and this Strawberry Moon is no different. Let it light the way to a clearer future.